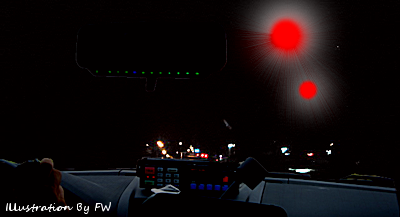 An Illinois law enforcement officer patrolling in Niles reported watching two silent, pulsing, red sphere-shaped UFOs, according to testimony in Case 57602 from the Mutual UFO Network (MUFON) witness reporting database. The officer was patrolling in the 8700 block of North Milwaukee Avenue about 11:15 p.m. on July 3, 2014, when the objects were first seen. One of the objects began moving slowly from west to east. . . .
. . . “They were basketball-sized spheres, approximately five-times the size of the strobe lights on an airplane, with a shimmery white halo completely circling the sphere. The red light was unlike anything I have ever seen, having a pulsating, almost ‘liquid’ or ‘living’ appearance, and glowing, rather than piercing the night sky. The white light appeared like an aura (similar to the heat you see emanating from a rocket or jet engine). I was awestruck.” . . .